There were 674 press releases posted in the last 24 hours and 154,030 in the last 365 days. NEW YORK, NY, UNITED STATES, July 6, 2018 /EINPresswire.com/ -- Much to the delight of her readers, Avalon Soulette Brown and her book, “My Two Bishops and Mother,” were recently named among “The Best of Summer Reading, 2018.” The announcement was made on July 25, 2018, in New York, NY. Every year, an award-winning journalist puts the spotlight on a select few of talented and distinguished, literary artists, worldwide to form the annual list. Genres include spiritual, inspirational, mystery, sci-fi, children’s, urban literature, and health and wellness. "When I first read about Avalon’s memoir, I thought, what a unique and inspirational story,” stated Fran Briggs, Publicist to Avalon Brown. "There will be more than a few who will identify with the struggles the two bishops went through. The book could serve as a blueprint for some readers who may have to overcome similar challenges in their own lives." “My Two Bishops and Mother” depicts how the author’s father longed to be a minister since he was a child. As an adult, he was mentored and became an ordained bishop. 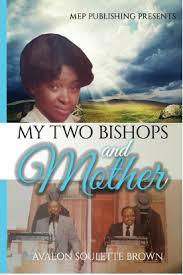 “My Two Bishops and Mother” is immediately available to order online at Amazon, and select traditional bookstores.